Do you have a building that needs to come down? Count on us. Here at JRP Tree & Demolition, demolition is one of our specialties (that’s why it’s in the name!). A proper demolition requires planning and preparation. We’ll prepare your site for your building demolition, cordoning off dangerous areas, and removing any property that may be damaged as the building topples. 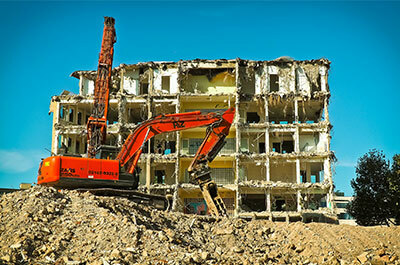 Once your site is prepared, we’ll get to work tearing down your building. We utilize specialized equipment and protective gear to remove structures. As we just mentioned, we provide lot grading and excavation services in conjunction with our building demolition services. We also provide a suite of tree services, including tree removal. We can prepare your site just as you’d like it, so that you’re ready to build your next structure. Here at JRP Services, we like to think that we’re simply the best demolition crew here in Houston. We strive to provide premier customer service, working with our clients to give them exactly what they’re asking for. We’re also a family owned and operated business, and we bring almost three decades of experience to the table. That means that we’re a business that you can trust, and we have a crew with the experience necessary to perform safe building demolitions. Now, you don’t have to take our word that we’re the best in town—view our previous clients’ reviews while you’re here. And if you’re ready to get started, get in touch with us to get a free quote for your upcoming demolition project!